My kids were fortunate enough to receive the brand new K'NEX 400 Pieces Tub for review from Team Mom recently, and they have been having so much fun creating with it! The K'NEX 400 Pieces Tub is a flexible building system that lets kids explore and build both 2-D and 3-D models. Made for ages 7 and up, my 9-year-old found it easier to make the 2-D designs while my 13-year-old son tried the more intricate 3-D ideas. There are 20 different models with step-by-step instructions pictured for your child to try, or they can venture into their imagination and create an original work of art. The possibilities are endless, so this is a toy they can use over and over again, unlike others they may get bored with after just a few uses. K'NEX works with other brands like Lego so if you already have other systems you can integrate them for expanded play. And kids can make their creations move (ferris wheels and merry-go-rounds that spin, wheels for cars, propellers for airplanes, etc. ), so there is plenty of after-building play. The best part is that all the pieces can be thrown back into the tub for storage once kids are done playing so there's no mess (which helps tremendously when you have a dog in the house who likes to sneak away with toy parts). 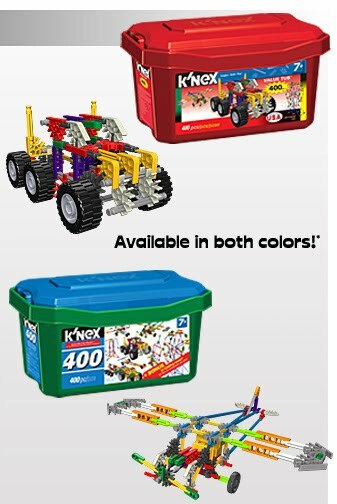 The K'NEX 400 Piece Tub retails for $20.99 and is available at Target, WalMart and Toys "R" Us. Right now, you can win $1,000 worth of K'NEX building sets for your child via K'NEX's "Make a K'NEXion" video contest. Details can be found on knex.com, (bottom, right corner).